As a boy I found Morris Minors rather boring and kept an eye out for Continental exotica or American giants. 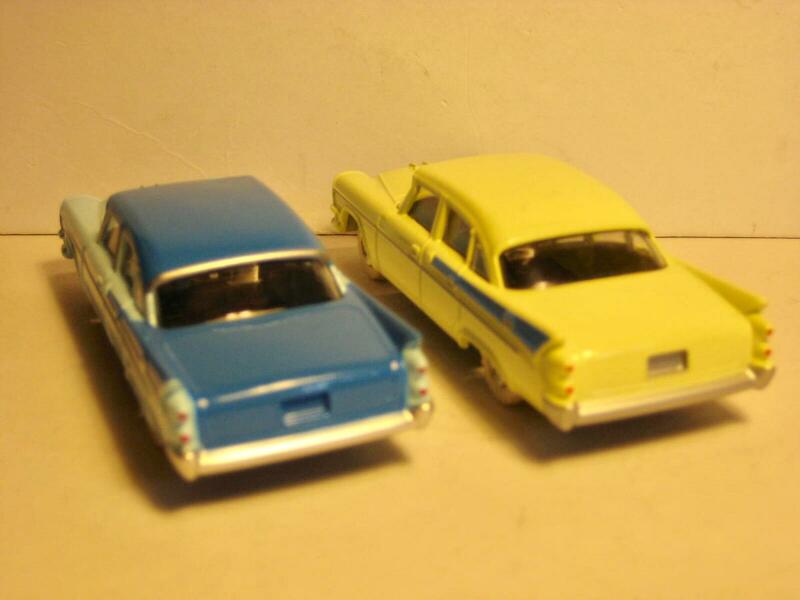 The Corgi Impala and Dinky Dodge Royal Sedan epitomised a wider world of exciting cars. This creamy and brown flash Dodge is my original, sporting a crack in the rear screen and some chipping but still quite nice. Note that there is no silver detailing to the rear wings or side strip. 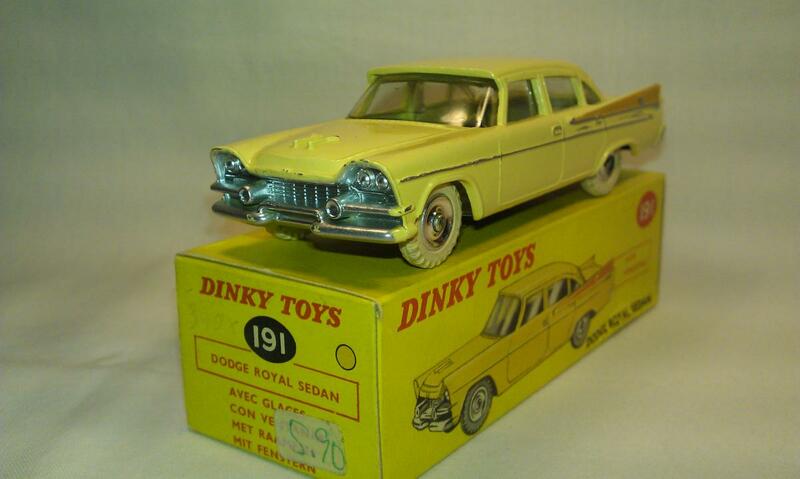 The arrival of the infamous Atlas copies renewed my interest in the Dodge and being lucky enough to have a mint Dinky 191 in green I looked at this in closer detail noting the presence of the side silver detailng. In other respects the two are the same including rear red lights and silver numberplate recess, as well as silver to the bumpers which never quite reaches the ends. 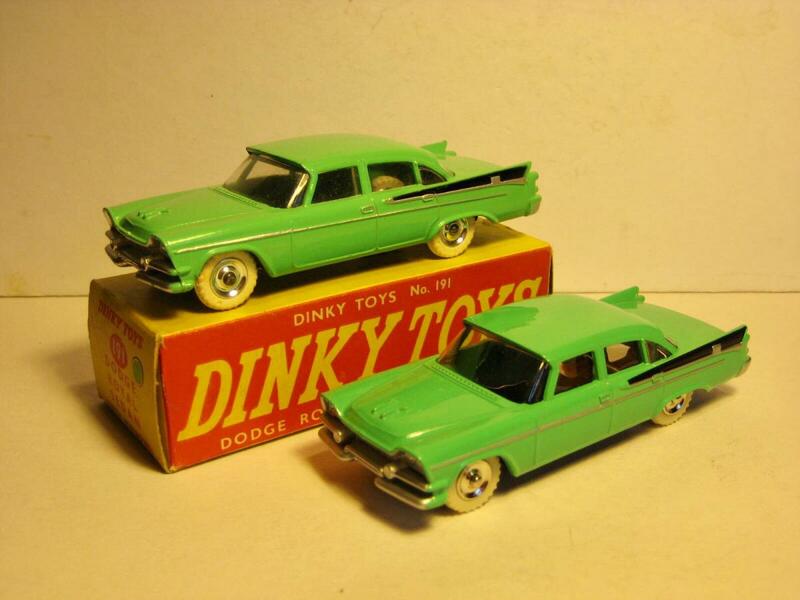 In 2015 Atlas issued in their U.K. Dinky series #17 the green Dodge 191. 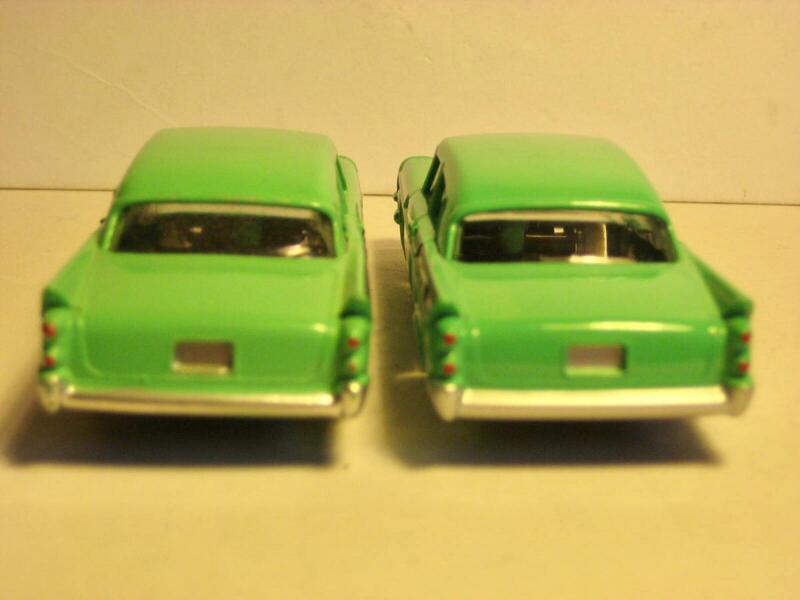 It is a close match to the original, although a slightly greener colour, more silver to the rear bumper, clearer glazing and amended baseplate text. Weight is surprisingly similar although the Atlas rattles more and feels less substantial due I think to a thinner glazing moulding. Atlas had earlier issued 191 in their French series #39 in 2011, in light cream with blue flash, a ‘sought after’ colour combination. 2017 saw Atlas parent DeAgostini issue the cream and brown Dodge in Italy #32, which will no doubt appear in due course in the current U.K. series. The colour is more a fawn appearing greyish against the original. 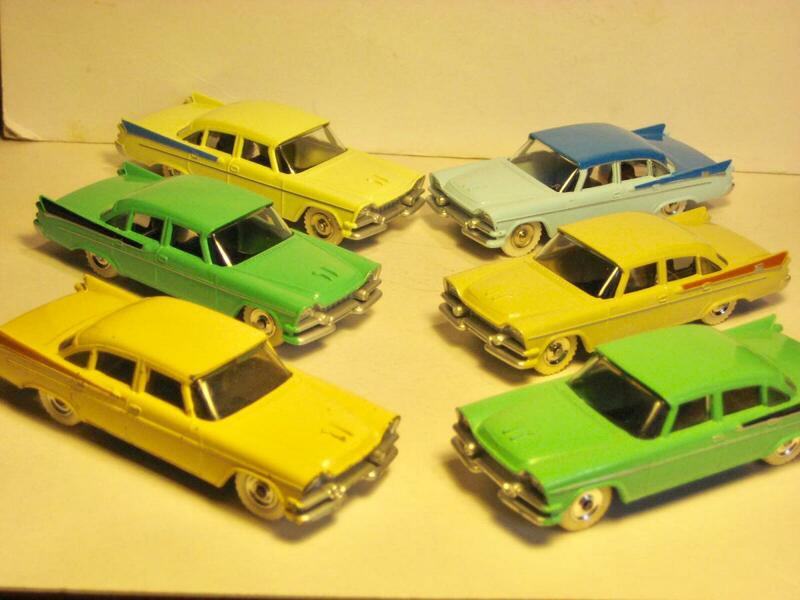 To compound the range of copies, some 4 two colour variants have appeared and although the base says Atlas they appear to be a factory inspired product. Shown here is the two tone blue. The dark blue is applied largely like the real cars and silver detailing extends to window frames although the C post is painted when it was chromed and the dark blue should extend to the rear light mid point. 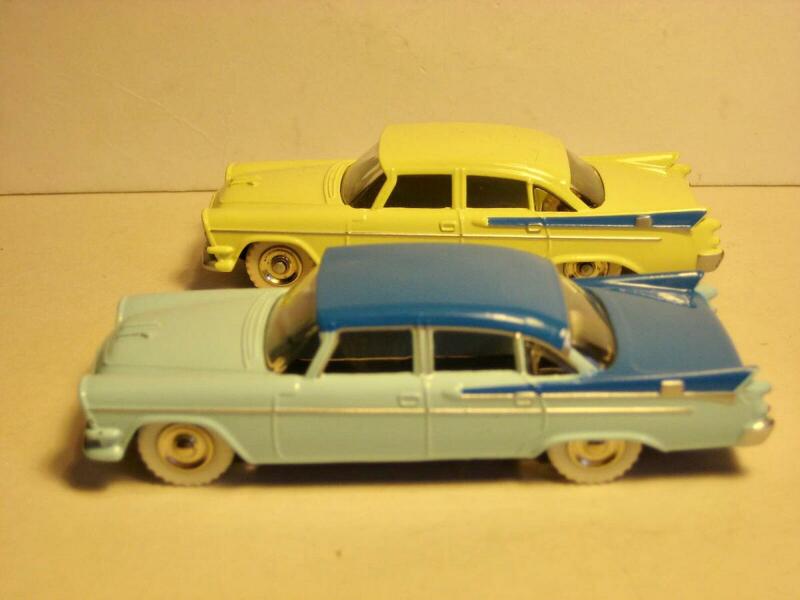 The colours appear to be based on Chrysler factory originals eg pink & grey. Patrick. A very interesting comparison of you from the DT Dodge Royal Sedan with the Atlas edition. Very interesting to see these different makes together. This compilation is already an interesting collection in itself. Indeed, at first glance little difference. 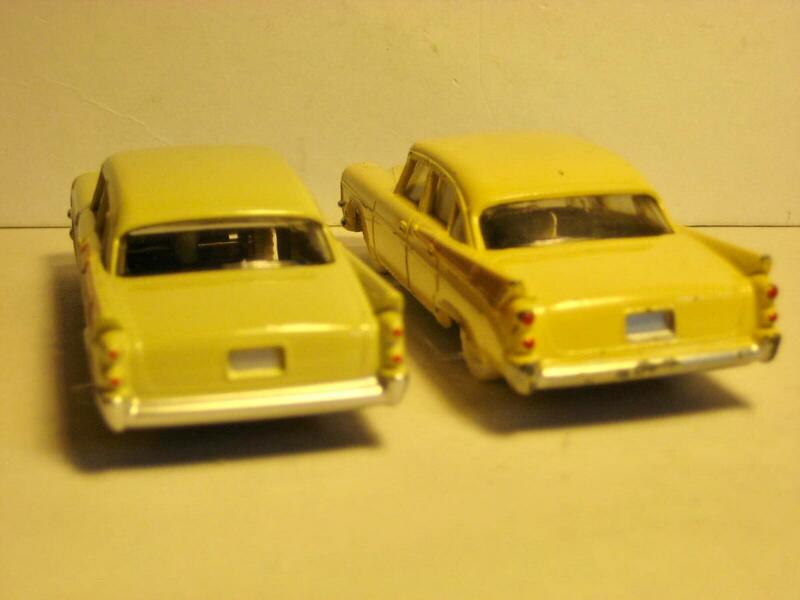 The DT models have been reproduced by Atlas so perfectly that it is understandable that they are very popular. If you do not want per se to collect original DT models, you can now build together a very nice "Dinky" collection with Atlas edition for a reasonable price. That may be said and seen. And they are completely new and affordable. Fortunately, on the basis of the atlas edition it must be mentioned that it concerns an edition Atlas, which makes it easy to distinguish it from an original DT. I especially like his complete silver front to see and of course his flash coloured wings. Many thanks for this nice work. Are Atlas getting into the code 3 business? Or is it code 4? 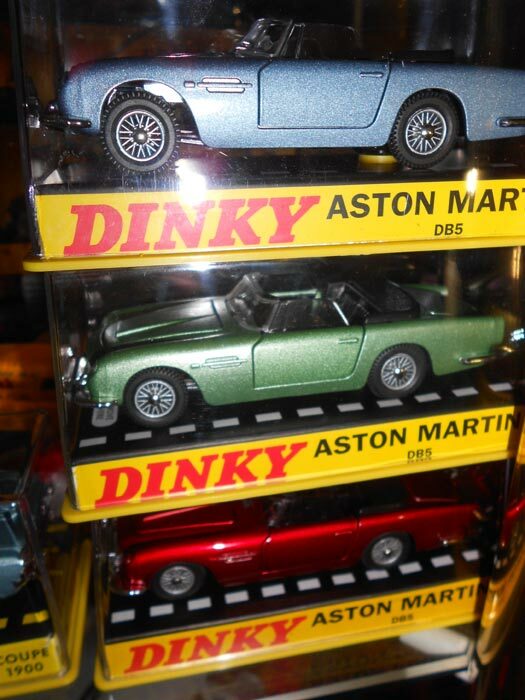 There is a precedent in various christmas specials and gift sets; black DS, pink TBird, green Carabo, etc. But now, as you're saying Pat, some unlisted mods are slipping out. 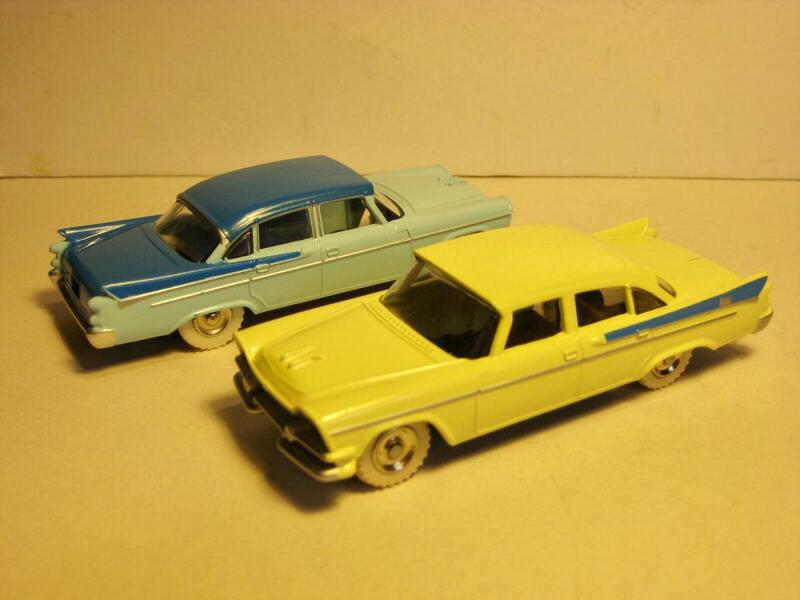 Blue and green DB5's and now the Dodge Royals . Notice that the boxes are colour spotted appropriately, so this is not just a bit of messing about by someone in the paint shop. There is organised intent here. I am following this discussion with interest, but what does the DB deterioration mean? In order to understand the discussion I would like to know. 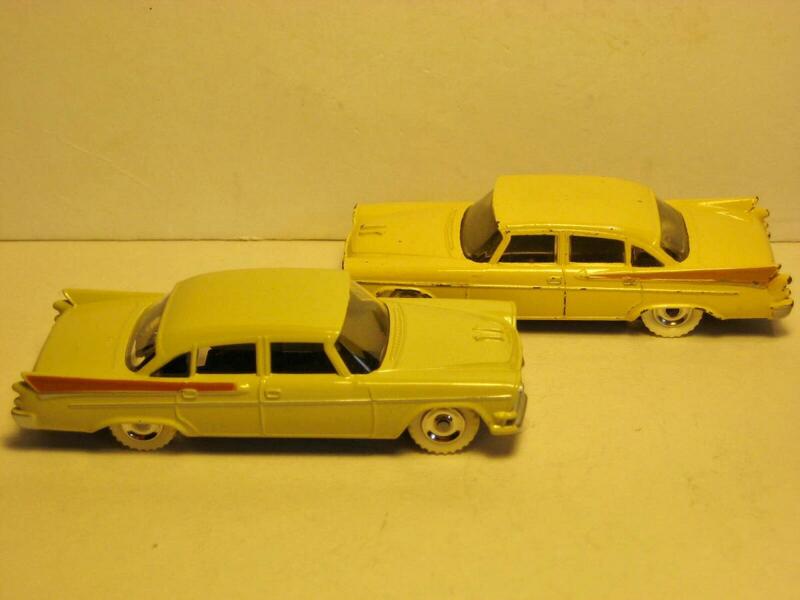 The entire title has been copied and pasted from the PDF File when only -191 Dodge Royal Sedan (1959-64) is required. I have noticed this since 8 March when theTopic was created and was hoping someone would raise the matter - I am glad you have. The "British DB Cars" in the title is unnecessary. DB stands for David Busfield who carried out most of the work with the PDF file for the new website. As it stands, this Topic will be automatically filed by the system alphabetically rather than numerically until "British DB Cars" is deleted by Patrick the original author. Bruce. Thanks for your explanation. I thought it was related to the DB5 below the name Aston Martin on the window box above, but now I understand. Just finished reading Bruce’s piece on the De Soto. Interesting about the roof paintwork particularly as it is within a cast area.